I was involved in the development of a commercial communications receiver for the merchant marine market in the early 1970s which can be seen in a photo of my shack in the Personal Interests section elsewhere on my website. 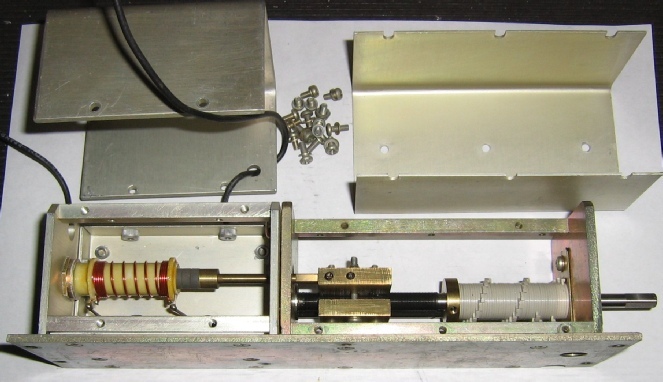 The photo below is of a spare of the permeability tuned oscillator that was used in the above receiver - still working smoothly to this day without any maintenance so far. It covers 7.6 - 8.8MHz and had to meet a maximum frequency shift of +/- 50Hz during bump and vibration tests. Frequency stability is extremely good. The tuning mechanism uses dust iron toroids mounted on a brass core that is driven by a very high precision threaded rod. The mechanism to prevent over-rotation of the input shaft can be seen on the right hand side. The U shaped screen over the oscillator section is made from 0.125 inch thick aluminium to ensure that it moves very little under vibration. The oscillator and buffer are contained on a PC board hidden behind a screen which can be seen behind the ceramic former on the left hand side. Note the wide spaced turns to optimise the frequency coverage and relative tuning linearity. A digital frequency counter was used to avoid having to ensure exact tuning linearity. Feedback and tuning capacitors were all silver mica. Type approval tests included wide operational temperature range around -10/+55C and even wider storage temperatures, maximum frequency shift of +/-50Hz during bump and vibration tests and continuous 95% humidity for up to 24 hours. Not cheap to make but very reliable!